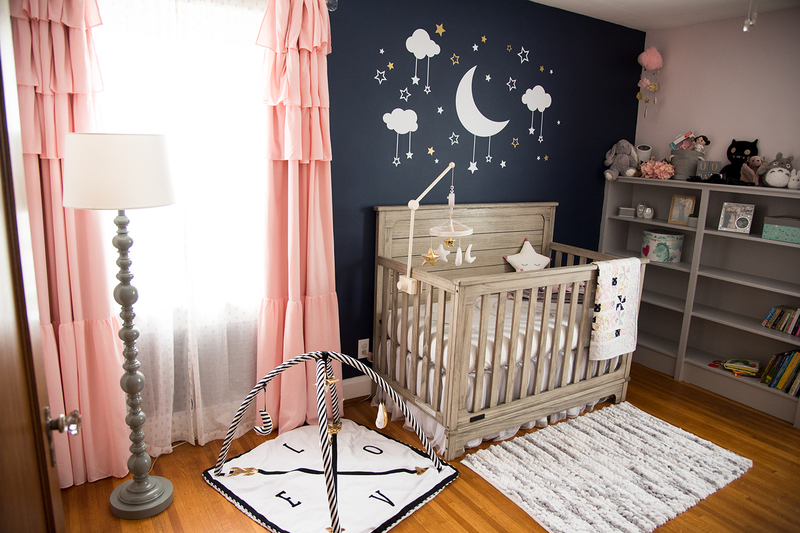 My first idea was to paint one wall navy to create a night sky over the crib and paint the rest of the walls a pale blush. I never thought I’d want to do pink but when I heard I was having a girl somehow it seemed right, like it would be sweet like her. Friends joked I would do purple, as it is clearly my favorite color, but that has always been my color, I wanted something different for her. 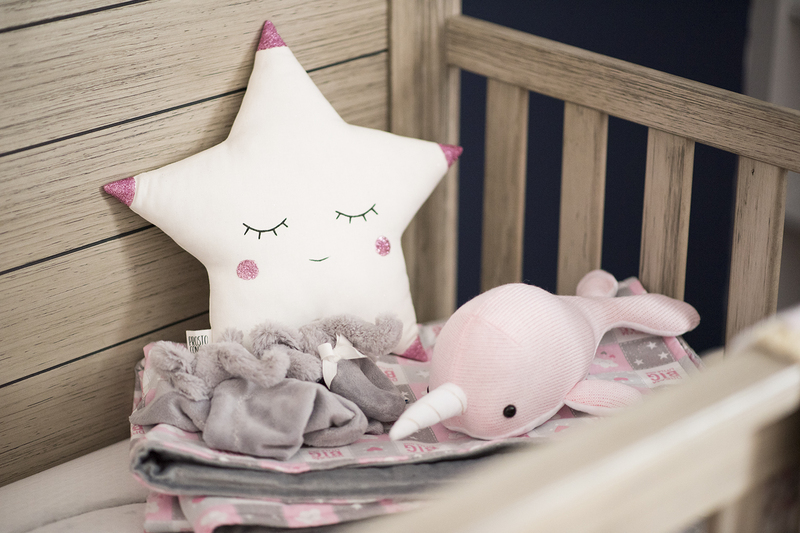 A stars and moon theme seemed fun and magical without being too girly so a bit of pink seemed a perfect balance. My husband spent over a week painting the room! It was a dark blue as it had been our den and guest room so going to blush on three walls was tough. 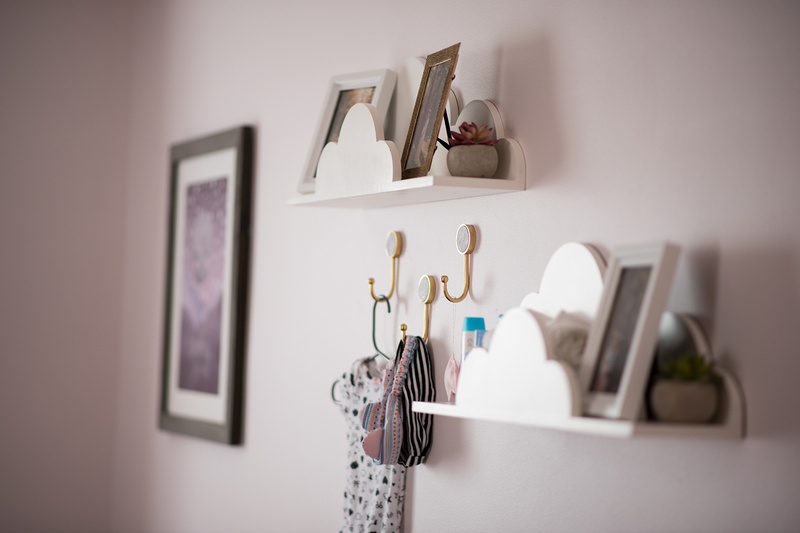 Also the trip was cream and when he started painting the walls it made it look yellow, so all the trim got repainted to white and the built in bookshelf to gray. 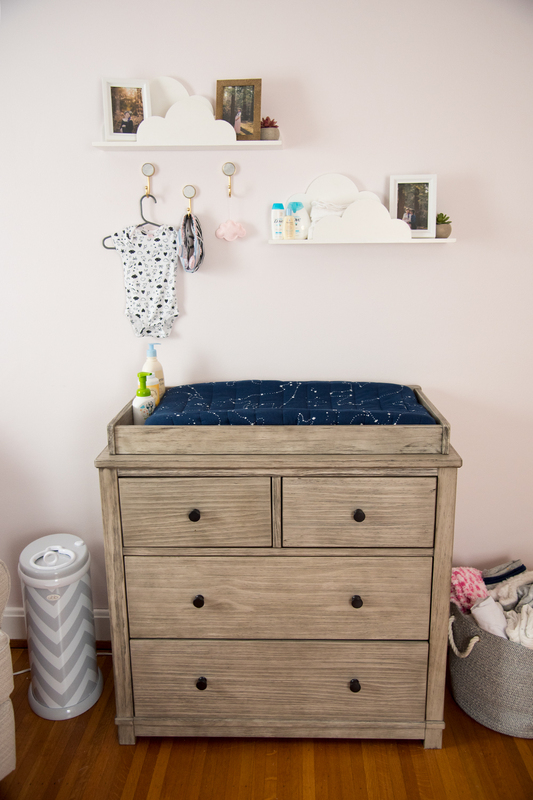 Next we picked out the crib and dresser which we found at Target for a great price! 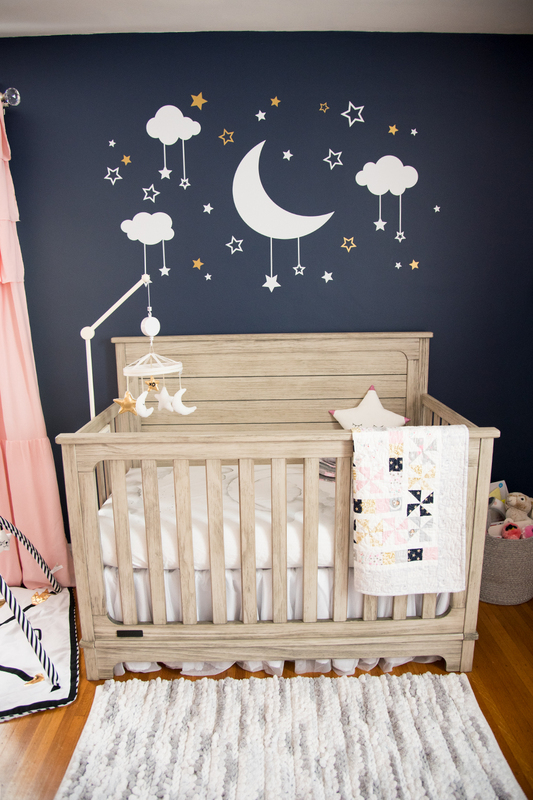 Then I found the moon, star, and cloud decals by BlueDesignCo. I was nervous about applying them but once I did the big moon to start I got the hang of it and it was actually quite easy! My parents got us the glider as a gift. It’s textured white and gray pattern fit perfectly! Then it was all decor and finishing touches. 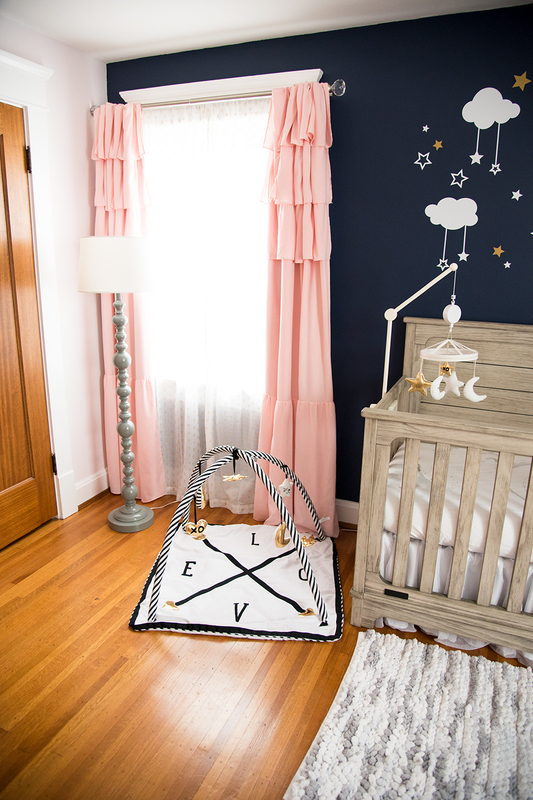 Got a fluffy cloud looking rug from Cloud Island by Target, a crib mobile and activity gym by Emily & Meritt for Pottery Barn Kids, a pink cloud mobile from SoloUnSogno, pillows from ProstoConcept, and finished it off by framing the Tinypix print that inspired the nursery theme! 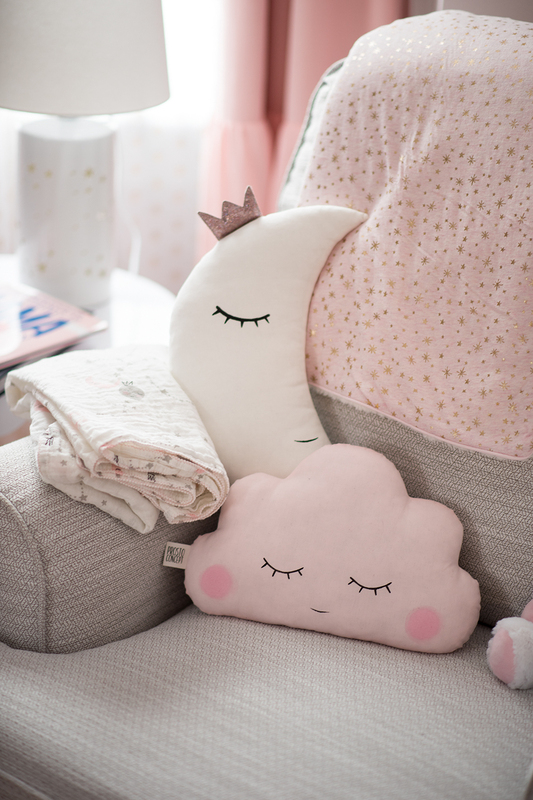 We got some amazing handmade gifts too including a beautiful quilt, a pink and gray blanket, and a moon lamp. 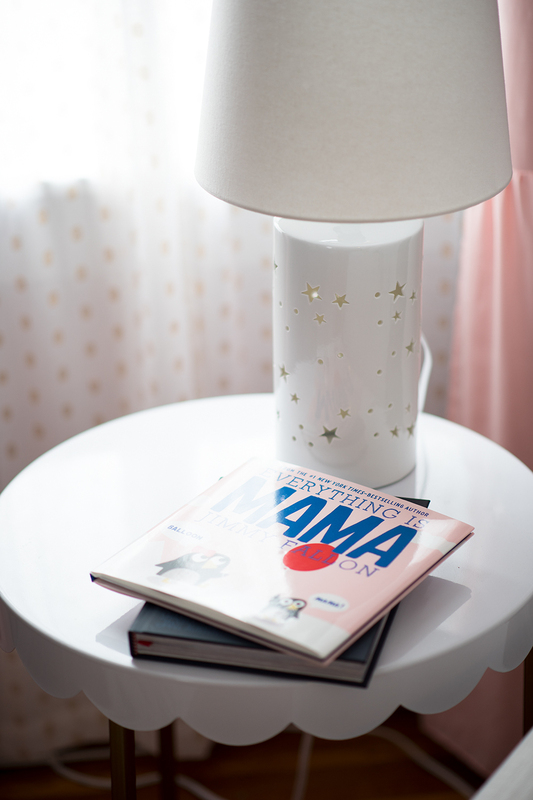 We are so happy with how it all came together! For more you can find shared photos about our pregnancy on Instagram with the hashtag #expectingpoe and check out my other expecting blogs!